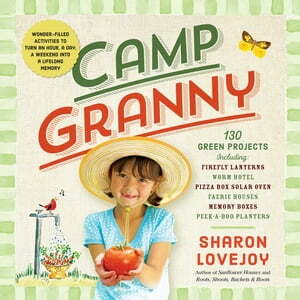 Collins Booksellers - Camp Granny by Sharon Lovejoy, 9780761164531. Buy this book online. Make leaf rubbings, blow jumbo bubbles, bake Moon Pizzas, create a firefly lantern. More than an activity book, CAMP GRANNY is an interactivity book, filled with 130 projects that connect grandparents and grandchildren through nature—in the kitchen, the garden, and the art room. Illustrated with evocative photographs and the author’s watercolors, CAMP GRANNY is a book about being adventurous, about being curious, about noticing and really seeing things—about instilling a lifelong sense of wonder. Please note: CAMP GRANNY was previously sold under the title Toad Cottages & Shooting Stars.